The Frigidaire FAD704DUD is the current 70 pint model in the Electrolux range, replacing the popular FAD704TDP. The launch of this new model was marred by a glitch which prevented the continuous drainage function from working properly. This has now been fixed with a new drainage kit from the manufacturer. Despite this early "hiccup" the new model has pleased most users and there are already many positive consumer reviews of this unit on reputable web sites. In my view the FAD704DUD is one of the best models for use in a basement and has earned its place in my list of the top five portables currently on sale. The Frigidaire FAD704DUD Dehumidifier is Energy Star® qualified and suitable for areas of up to 1400 square feet. It is not a low temperature dehumidifier and will work best at normal room temperatures, around 65°F and above. The FAD704DUD has all the features of the previous model. Improvements include a more compact casing and a higher air flow (CFM) volume. The new model is also said by reviewers to be a little quieter than its predecessor. When the appliance switches to "defrost mode" you know that ice has formed on the cold coils. The compressor has been stopped by the auto-defrost function and will not restart until the ice has melted. This feature allows the unit to operate safely at temperatures between 41°F and 96°F. When it's cooler than 65°F however the appliance does not work very effectively. If your basement is cold a low temperature model would be a better choice. This feature allows you to program the level of relative humidity (RH) you want the appliance to maintain. Set it and forget it. The unit will cycle on and off as needed to keep to the programmed level. The level of RH I recommend is 45-50%. If the unit is in your basement you probably won't need to move it very often. When you do move it you have both carrying handles and casters to make the job easier. It weighs 44lbs. You may simply use the water collection bucket but I guess most of you will want to use the continuous drainage feature. As I have already mentioned there were problems with this feature when the Frigidaire FAD704DUD first appeared. A drainage kit is now supplied for the appliance which seems to have solved the problem. Please remember this is a gravity feed and keep that hose running down-hill all the way! The "Ready-Select™" electronic controls are one of the strengths of this unit. They are simple to understand and easy to use. The main purpose of the filter, "anti-microbial" or not, is to protect the appliance. It's important to take the filter out and clean it every couple of weeks if you want your dehumidifier to work at its best. This is a simple on-off, 24 hour timer which some owners find useful. If you've gone fishing for the weekend you don't want to come back on Sunday and find that your machine was stopped by a power outage and has not been on for two days. Auto-restart makes sure that when the power kicks in again the unit will switch back on at its last programmed settings. A large majority of reviews by users are favorable with many five and four star rankings. The FAD704DUD eats up moisture and users are unanimous about its power and effectiveness. If you are looking at the reviews yourself you will notice that there is still a lot of fall-out over the problem with continuous drainage. This problem seems to have been solved now but clearly Frigidaire "dropped the ball" at the launch of the new model. If you are using the bucket you will be pleased to know that most users find it easy to take out and replace. It does fill up almost to the brim so some care is needed. The word on noise is mixed. Some find the appliance loud while others have remarked that it is "much quieter" than their previous model. On balance the majority find it quiet for such a powerful unit. The controls are highly thought of by almost everyone who mentions them in a review. "Easy to use" and "simple to understand" are typical phrases used. The FAD704DUD has clearly taken over the spot once filled by the FAD704TDP. If visitors to this site are anything to go by the new model is the most popular large capacity portable available in the USA today. It is effective and does everything it is supposed to do. The problem with continuous drainage seems to have been solved and removes the only reservation I might have had about this model. The new model is not only as good as the FAD704TDP it is more compact and, according to many of the reviews, a little quieter. How long will it last? Sadly it seems that portable dehumidifiers are only good for a couple of years these days whatever the brand. The Frigidaire FAD704DUD is competitively priced so, if its working life is no longer than the other leading brands at least it will have cost you less. 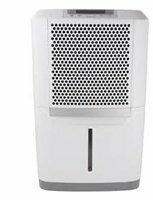 Measured against the competition the Frigidaire FAD704DUD Dehumidifier is a good choice and I am pleased to recommend it to you.